Our modern fleet of luxury coaches and buses includes vehicles to carry from 16 to 55 people. All our Coaches and Buses are fitted with seatbelts for your safety, comfortable seats, air conditioning and toilets for your comfort and convenience. 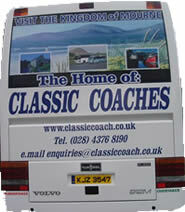 We can cater groups of 16 to 55 using our fleet of luxury coaches and buses. We can offer a great level of comfort and service for any size of group no matter how big or how small. We have well equiped vechiles to pull small trailers for anything in your a imaganation. Meaning we can cater for weddings or other special events. Classic Coaches luxury coaches and buses can be privately hired for any event, from day trips, business trips, shopping expeditions, wedding and school trips to other sport events and tours. 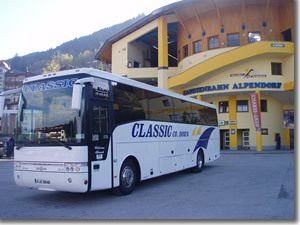 The coaches, ranging from 16 to 55 seaters, have all that you would expect from a luxury coach. 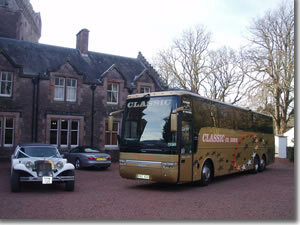 At Classic Coaches, we can accomodate a wide range of group outings to suit your individual needs. Please contact us or use our on-line inquiry form to discuss your specific requirements. We are members of the Federation of Passenger Transport Northern Ireland.